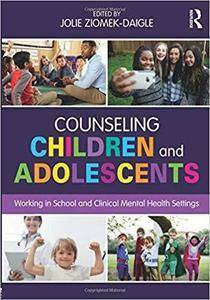 Counseling Children and Adolescents gives students the information they need to prepare for work in both school and clinical mental health settings (two CACREP―Council for Accreditation of Counseling and Related Educational Programs―specialty areas). This text includes not only content related to developmental and counseling theories but also information on evidence-based practices across the continuum of care, diagnosis and treatment of youth, and current trends such as integrated care, mindfulness, and neuroscience. Unique to this book are sections on both the instructional and behavioral Response to Intervention (RtI) model and PBIS, examples of evidence-based practices used across settings such as Student Success Skills, Check & Connect, and trauma-focused CBT, and a review of common mental health-related disorders most often seen in youth and treatment recommendations. Ethical and legal implications are infused throughout the book, as are CACREP learning outcomes. Instructors using this textbook can also turn to its companion website to access test questions for each chapter. Expansive and practical, Counseling Children and Adolescents fills a gap in counselor preparation programs and provides an important resource that can be used across specialty areas and coursework.